The start has been made - only little more than two months :-) after our summer vacation the first image is hereby published and the related new web section is openend: Voila! Our first travel to Italy's grandios and world-famous region Tuscany was surely not the last: Wonderful land- and seascapes, cultural highlights and all "typical" vacational features for the family - and so much more to see for future trips. 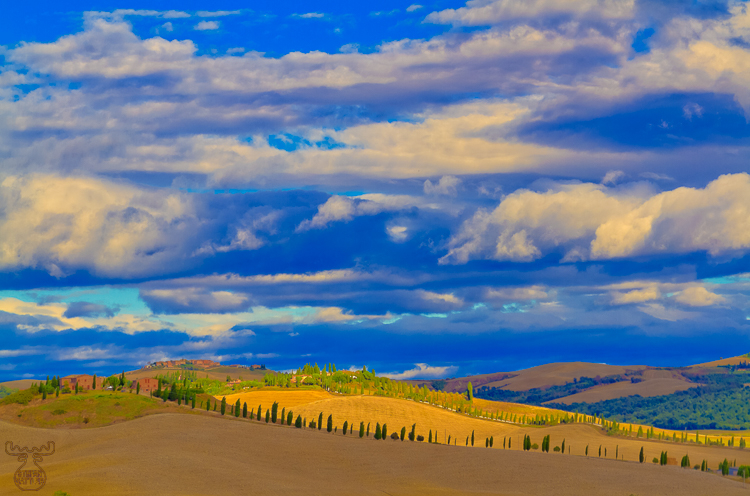 To start the new section, the image of the Crete Senesi seemed worthy: It is one of the most depicted areas in Tuscany, South of Siena (besides the leaning tower of Pisa maybe). The name literally means "Senese clays" and refers to the grey Mattaione clay sediments seen in many spots. Looking at the rolling hills and picturesque lonely houses on hill tops - surrounded by rows of cypresses - lets the imagination run wild and the memory cards filled faster than usually. It is the landscape lit by special spotlights created by fascinating clouds - combined with different sights whereever you turn to. The views immediately give the association with the many paintings and pictures of Tuscany we had seen before our personal acquaintance. Although it was already late summer and most of the green vanished, most of the Flowes already withered, the 2 weeks created more picture outcome than ever before.